Storytelling is an ancient human practice, a means by which people create and share meaning, values, and information for how to live in the world. Sharing personal stories is a powerful way to build connections and empathy between all peoples. 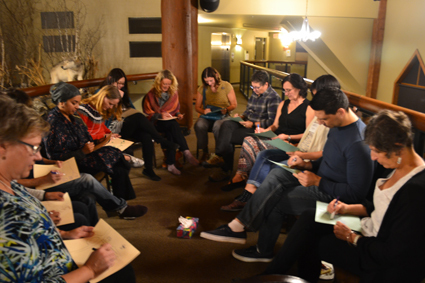 At an SHFS story circle in fall 2017, storytellers engage in a memory mapping activity to spark story ideas. At the SHFS, we work to support storytelling in many forms, whether it be sharing out loud, through writing and poetry, or through other forms of expression. Everyone has a story, and every story is important! Karen Culture Camp: Storytelling skill-building for newcomer youth. Moving Stories YXE Phase II: Community-based research on storytelling for social change in Saskatoon and Regina. Culture Days Podcast: Life is a Story, Tell it Well! An intergenerational, intercultural storytelling event at Prairie Prism in Saskatoon.